Strictly defined, Crowdfunding is a method of acquiring money for a product or brand. Crowdfunding has become hugely popular amongst the start-up fraternity. It allows entrepreneurs to receive payment for products they are yet to release. Thereby acting as a catalyst for companies to begin selling, before they may actually have enough money to send the product out to market. Donation/reward crowdfunding – Allows people to “vote with their money”. People interested in the product may decide to donate towards the product’s release. In exchange, they may gain specific rewards, usually detailing towards the product itself. They can vary from merchandise, extra utility of the product, or other opportunities that the company may present. Equity crowdfunding – Allows people to invest in the company. This brings the product to market and potentially gain a portion of its potential profits. The profits will vary depending on the level of sales of the product on release. The profits are often divided up in the form of “shares”, but this may not always be the case. Debt funding – People may choose to pay money towards the product in the form of a secured debt against the company or a fixed interest rate. After the product’s release, their investment would usually return at a pre-agreed APR%. This will calculated against the capital invested. Crowd Cube – A website allowing you to perform Equity funding on many varied products. Has no limit on the product in question, and products promoted can be virtual or physical. Kickstarter – Focuses on reward schemes rather than having a share of the profits on the project you invest in. It is the largest out of most other crowdfunding websites. Offers all types of project categories. Seedrs – Equity funding website, causing you to directly gain back a part of any profits made from the business. Works with all types of projects. Indiegogo – Allows you to market your product while providing reward based funding to potential customers. Allows a company to release their product and start generating revenue. Born.com – Reward based, and founded on the London Google campus. Allows users to directly pay for the product instead of funding it for a wider release. While it doesn’t help for a total product launch, it does help the company build up profits in preparation towards that. A card game based around a version of “Russian roulette”. It was visually appealing to the consumer, and was significantly more casual in it’s marketing. They reached the target goal within one day, and met all of the rewards they had promised. They have since produced 2 expansions and raised millions. An advanced modern wheelchair that focuses on helping the physically impaired with movement. A charity called The Royal Marines backed the company. This, in combination with a targeted campaign to other “armchair investors” caused the funding of this project and enable the founders to create the first prototype. A company that aimed to produce an affordable and reliable 3D printer that many different people can use. Whilst it raised 1.3M, it did not reach its 1.5m goal, and was thus cancelled. Unfortunately, the backers who the company promised a 3D printer to in advance were not refunded. The initial target was possible too high. Failure to respond well to backer requests during the campaign caused stagnation and possible reticence from new backers. This affected the funding momentum during the latter stages of the campaign. 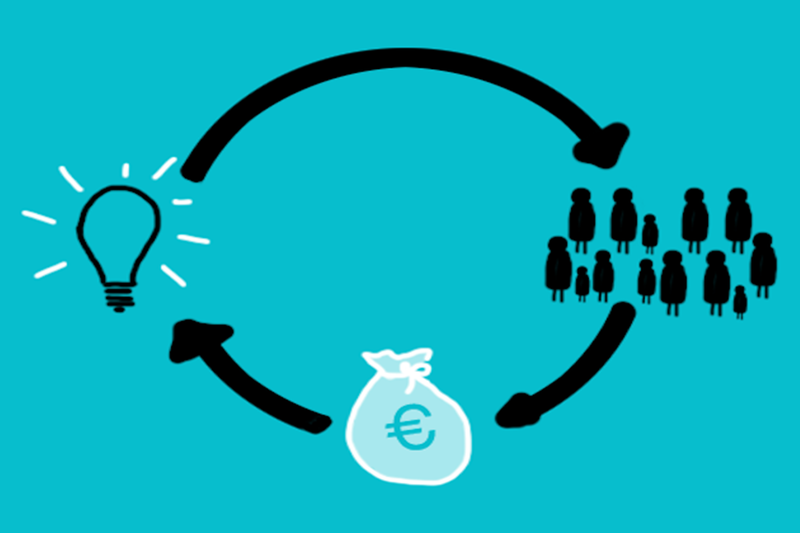 Image is a modified version of "Crowdfunding" by Rocio Lara.